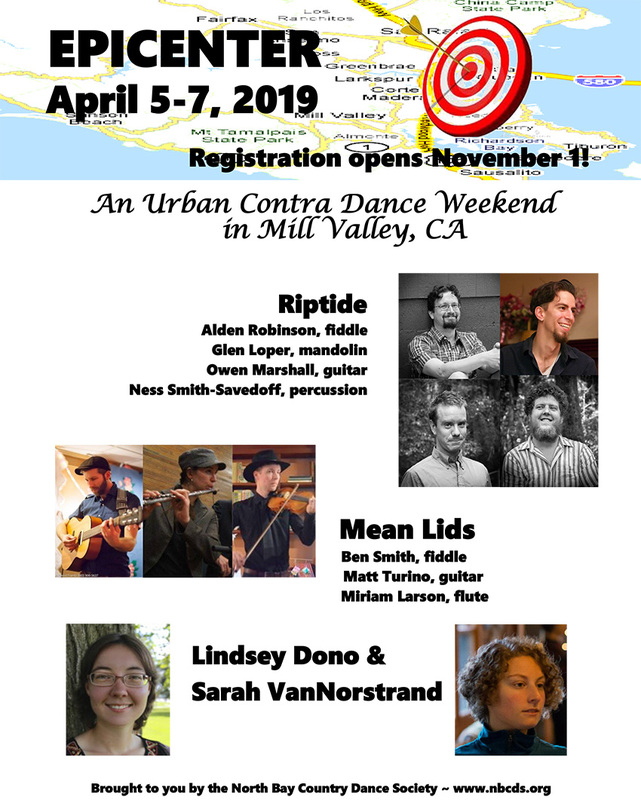 The Epicenter Dance Weekend will be held in gorgeous Northern California the weekend of April 5 – 7, 2019. The setting will be picturesque Mill Valley in the heart of Marin County, just north of the San Francisco Golden Gate Bridge at the beautiful Strawberry Reception Hall. The result will be a weekend of nearly constant Contra dancing to satisfy even the most discerning of dance fanatics. Riptide describe their music as “wicked good music from Maine.” Alden Robinson on fiddle, Glen Loper on mandolin and feet, and Owen Marshall on guitar play some of the most energetic Contra dance music on the scene. It will get even more wicked and energetic with the addition of Ness Smith-Savedoff on percussion. The Mean Lids (Miriam Larson, flute & jaw harp; Ben Smith, fiddle & banjo; Matt Turino, guitar, fiddle & feet) are only as mean as they need to be to keep the grit in their tones and the edge on their tunes. They are never seen without their signature cranial apparel. Spot them by their hats, their long lonesome sounds, and the @$$ kicking grooves emanating from their mean, mean fiddle fingers. Sarah VanNorstrand, from Syracuse, New York, has called at many weekends and festivals nationwide. She is popular because of her engaging manner, as well as her clear and effective teaching style. She has a large repertoire of fun and interesting dances. She is attentive to the dancers and strives to make sure everyone is having as much fun as she is. Lindsey Dono, originally from Massachusetts but now a Washington mainstay, calls with a confidence and graceful expertise that belies her youth. Her meticulous programming and serene instruction is a fine counterpoint to the musical exuberance. REGISTRATION & CANCELLATIONS: Registration opens November 1, 2018. The registration fee is $155.00 (checks are $150.00); under age 30 is sliding-scale $80.00 – $155.00. Registration is not transferable. All cancellations are subject to a $20 processing fee. After March 18, 2019 the full fee will be retained unless we are able to fill your place. Refunds will be processed as soon as possible, but may not be paid until after the event. A limited number of half-off work-trade positions are available.